Today, Drew and Michael are discussing Black Cloud 1, originally released April 5th, 2017. As always, this article contains SPOILERS. 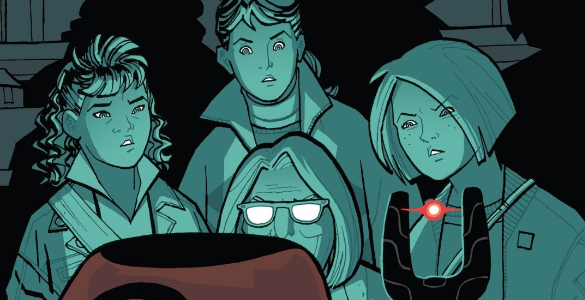 Today, Michael and Ryan M. are discussing Paper Girls 6, originally released June 1st, 2015. Today, Greg and Spencer are discussing Daredevil 8, originally released September 17, 2014. Greg: I went and saw a movie last week against my better judgment. That movie was the clunkily titled Frank Miller’s Sin City: A Dame To Kill For, a comic-book adaptation and sequel to the excellent 2005 adaptation of Miller’s hard-boiled neo-noir stories. My roommate, who shares my love of this first one, warned me it was terrible. Rotten Tomatoes warned me it was terrible. I didn’t listen. I went and saw it, and boy, terrible doesn’t scratch the surface. It’s a miserable piece of garbage. I could spend hours rage-explaining (ragesplaining?) what is so fundamentally wrong with this dreck, but one criticism stands head and shoulders above the rest: The stylistic tics and techniques are arbitrary, meaningless, and add nothing to the story. Conversely, any play with form in Mark Waid and Chris Samnee’s outstandingly excellent Daredevil 8 are part and parcel of an intense, dark, and captivating story.